Maechee Chuejai Pathumnan was born on July 22, 1962 in Kanchanaburi, Thailand. A maechee for 25 years she practices and teaches vipassana meditation. Maechee Chuejai Pathumnan holds a Bachelor’s Degree in Early Childhood Education and is now working towards her Master’s Degree in Curriculum Development and Educational Administration. Her work experiences include: teaching morals and ethics in the Thai countryside, teaching occupational education to housewives and teenagers, and administering the Early Childhood Center of Boonsi Munigone Temple. 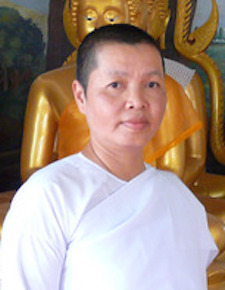 Currently, she is the Abbess of the Rattana Paiboon Meditation Center in Bangkok. Maechee Choojai also directs the Early Childhood Development Centers of the Thai Maechee Institute in Buriram and Bangkok. In addition, she teaches at the Occupational College of Bangkok.